Rosy red radishes and emerald greens pair together in this seasonal risotto. Topped with toasted pecans, you will find that the sweet, savoury, and hint-of-bitter flavours balance one another beautifully. This novel twist on risotto makes an elegant side dish or vegan main course. There seems to be some confusion as to when summer starts. It’s May, and I say that spring is still here. Summer starts in June. Spring is the best time for planting quick-growing radishes. They are so simple to grow that we actually managed to plant and harvest some last year, though we planted ours at the end of the summer. Hopefully this year we can get our seeds sown in May, since they only take about a month to mature. Whether I spy a fresh bunch at a farmers market or pull up some home-grown radishes from our plot of earth, it’s nice to know I can make this delicious risotto from roasted radishes. Because despite having a radish-loving daughter, I merely tolerate crisp red-rimmed slices in salads. However, I found that roasting radishes mellows their peppery bite and gives them a flavour that is similar to kohlrabi or turnips. The roasted radishes blended beautifully with the creamy risotto flavours. I even saved some risotto for lunch the next day, and it tasted just as good if not better! Preheat oven to 425 degrees F (210 C). In a medium bowl, blend together 1 Tablespoon each of olive oil, lemon juice, and honey. Toss with cut radishes. Grease a baking tray with olive oil and place radishes on the tray. Discard the marinade. Roast for 15 to 18 minutes, stirring once or twice to help the radishes cook evenly. Set tray aside to cool. Meanwhile, heat broth to a gentle simmer. In another skillet or large sauce pan, heat butter over medium heat and add olive oil. Saute onion or shallots for 2 minutes before adding garlic and rice. Cook for one minute and then pour in wine, stirring constantly. When wine has mostly evaporated, begin adding hot broth, 1/2 cup at time. After each addition of broth, stir for several minutes until risotto thickens before adding the next portion of broth. After adding the last 1/2 cup of broth, stir in spinach leaves and roasted radishes. Continue to cook and stir until liquid is absorbed. Remove risotto from heat and keep warm until ready to serve. Just before serving, top risotto with lightly toasted pecans. I share recipes here, at Allergy Free Wednesdays, and at Gluten Free Wednesdays. Thanks, Johanne. Are you a radish fan? I do enjoy the spring radishes. 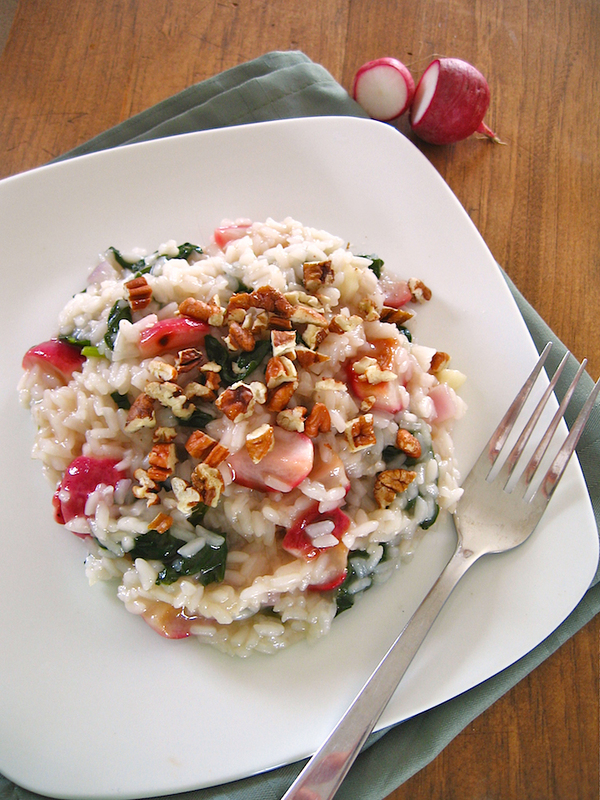 I love risotto and this dish looks like the perfect way to use fresh radishes! We tried planting radish in our garden once and it didn’t do too well so I haven’t tried it again. Crazy Florida temperatures and rain wreck havoc on my garden sometimes. Yes, gardening can be tricky. We tried growing cucumbers and zucchini in Nebraska and mostly failed. Last year was our first attempt at radishes up here in Saskatchewan. I keep meaning to try risotto, and the fact it can be dairy free is great. Thanks for sharing. 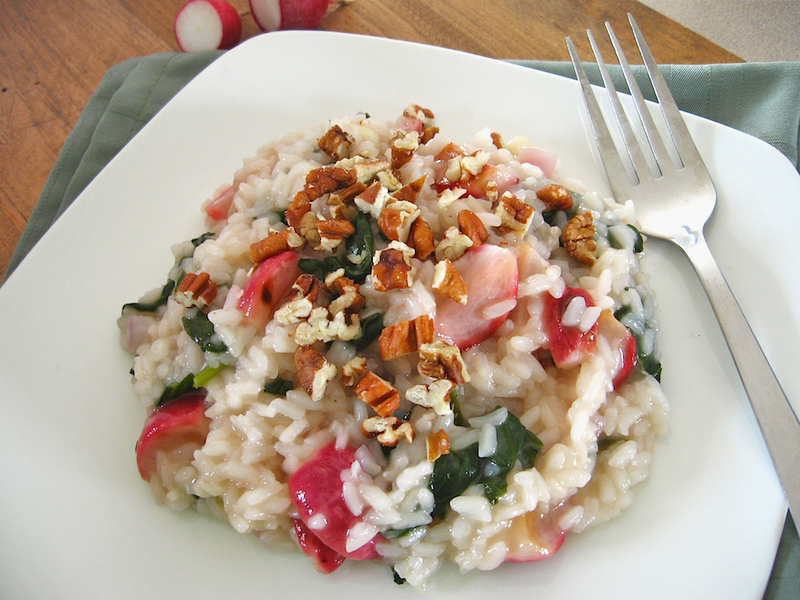 I love both risotto AND radishes! 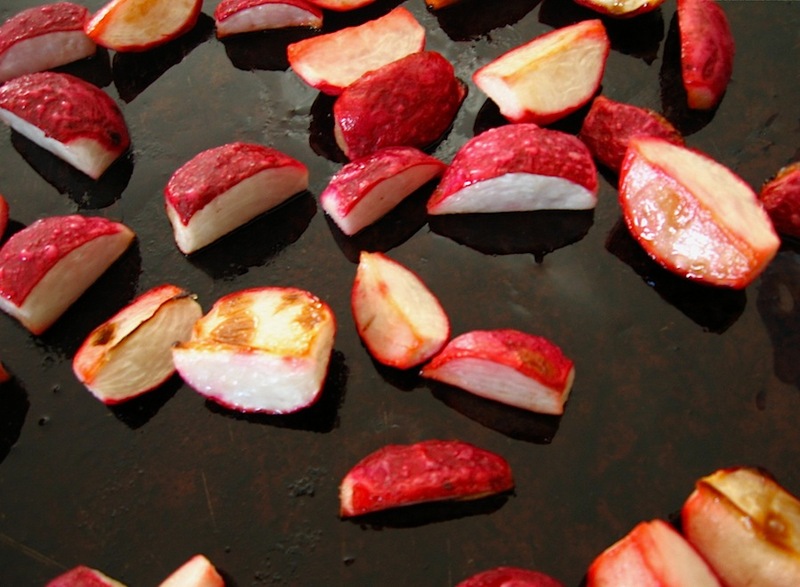 Using roasted radishes in this way is such a good idea and something different for spring. You’ve inspired me to whip up something similar for dinner this weekend! I’m so happy that you are planning to go for it, Jennifer. Enjoy every bite! Such a beautiful Risotto! I’m enjoying the colours and the flavour profile sounds delicious! Thanks! It just shouts spring to me. Wow, I’ve never had radish with rice before. Interesting combo.